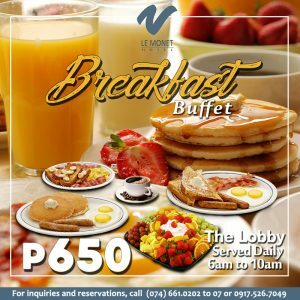 Sample our Breakfast buffet offering from 6-10am Daily. 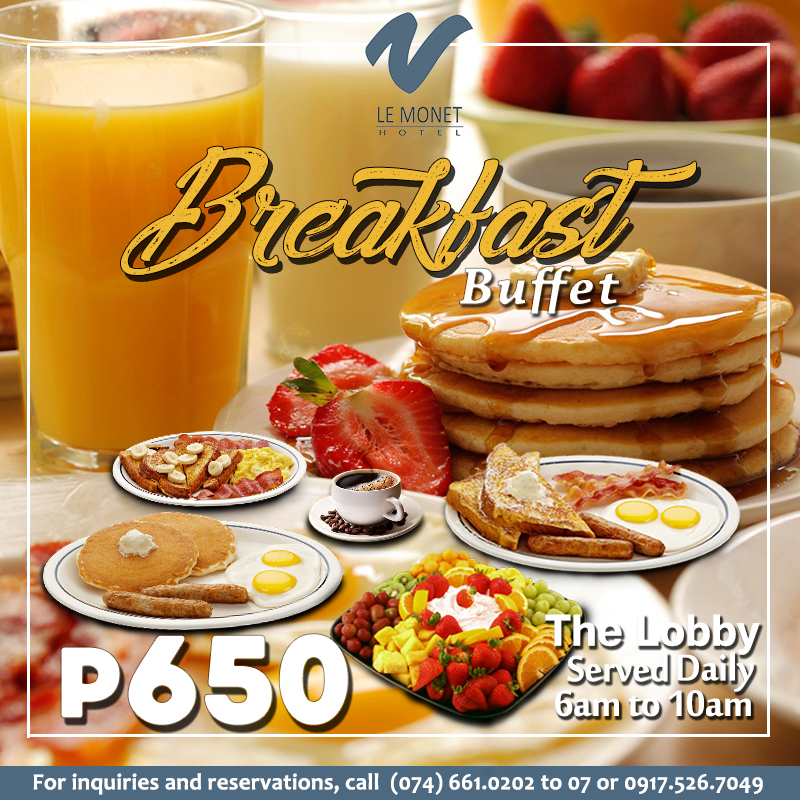 Let our Chef and his team of culinary experts astound you with their special breakfast menu. We have a sizable selection of healthy, tasty, savory and mouthwatering dishes from fruits, the freshest hand picked vegetables to bacon &amp; pancakes… And if you haven’t heard, our EGGS BENEDICT is to die for! 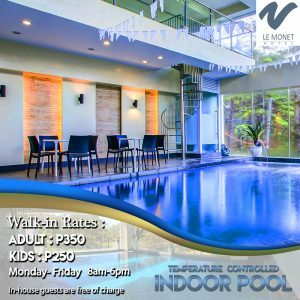 For only Php 650 net. 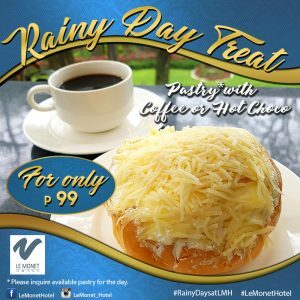 Try our pastry & coffee/hot choco combo at the lobby of Le Monet hotel for only Php 99 net, served daily. 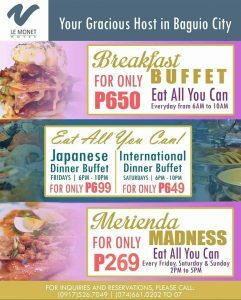 for only Php 269 nett. We offer a wide selection of all time favorite Merienda comfort food and for those healthy eaters, we also serve a lot of healthy options. Don’t let the cold weather or rainy season stop you. 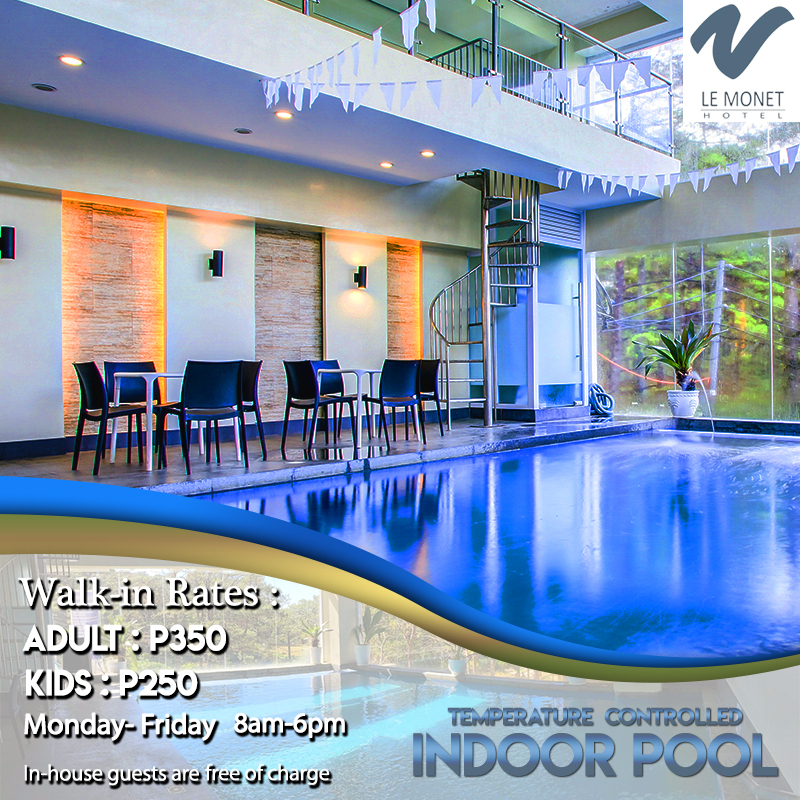 Just go for a dip in our temperature controlled indoor pool, while enjoying the view of towering pine trees!Our pool is open from 8am-6pm from Monday- Friday. Say Konnichiwa to a world of flavor. 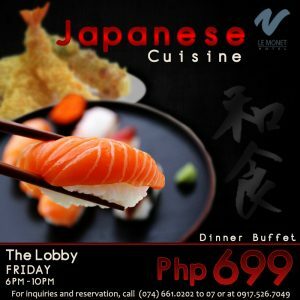 Sample an extraordinary Dinner Buffet that features a wide array of gastronomical Japanese dishes. 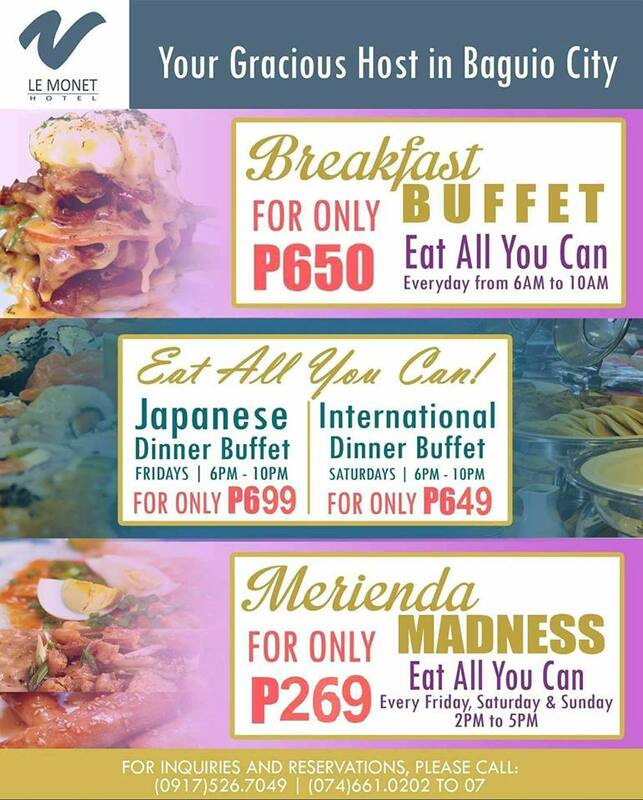 Try our All-you-can-eat Friday dinner buffet for only Php 699 net per person. 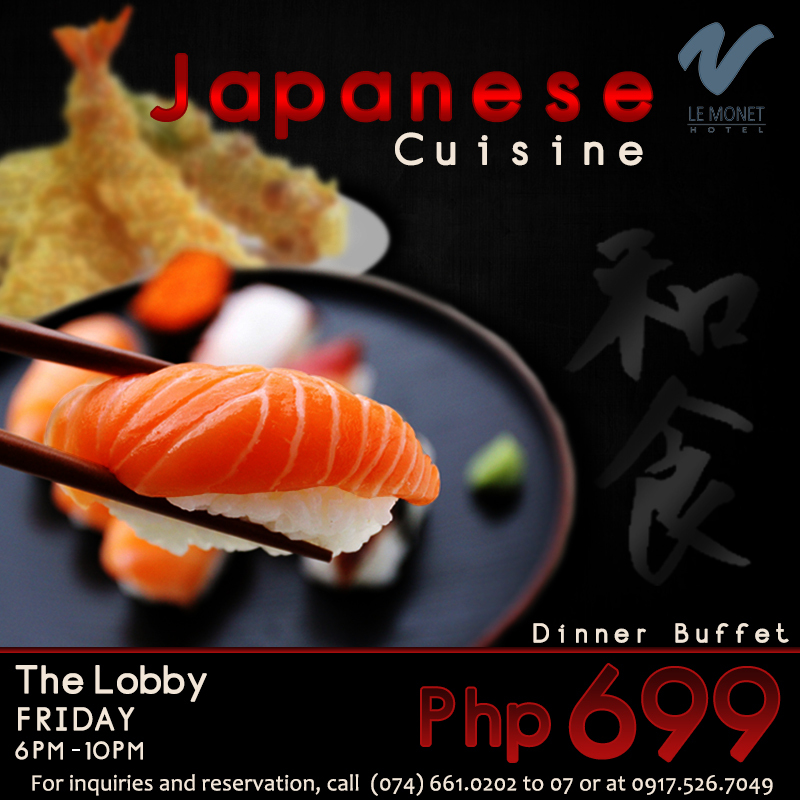 Dinner starts from 6-10pm at the lobby of Le Monet Hotel. 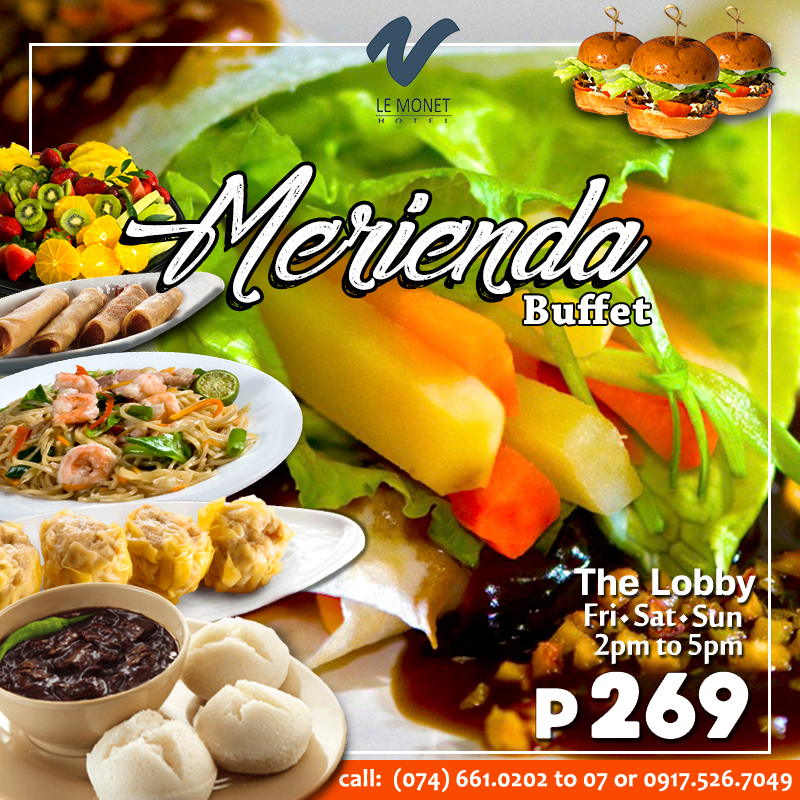 Indulge on a gastronomic journey with our International dinner buffet for only Php 649 net. You can enjoy a dynamic fusion of local and international dishes prepared by our Chef and his team of culinary experts. Dinner is served from 6pm-10pm. Beat the heat in the metro, time to hit the road and enjoy the cool weather in the City of Pines with our Staycation package for only P6,899 net. 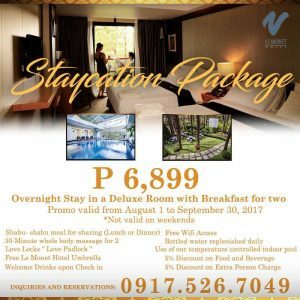 – 5% Discount on Extra Person chargePromo is valid from August 1 to September 30, 2017.